Aberdeen manager Derek McInnes says his side can not use the award of a late St Johnstone penalty as an excuse for failing to pick up all three points. Liam Craig scored from the spot in the dying minutes of the game after Ryan Jack had fouled him, cancelling out Simon Church's opener. "It's a missed opportunity," he said. "It's a game where if we want to meet our aspirations we should be winning that game and seeing it out and we haven't." A win would have closed the gap on Premiership leaders Celtic to four points after Ronny Deila's side drew 1-1 with Hamilton on Friday. "Whether it's a penalty or not I still believe we should deal with things better in the build up to it," added McInnes. Church had given Aberdeen the lead in the first half on the rebound after Saints goalkeeper Alan Mannus saved from Ash Taylor. The Welsh international, on loan from MK Dons, had chances to stretch the home side's lead as did both Niall McGinn and Peter Pawlett. The Aberdeen players were left furious though with the award of the penalty by referee Steven McLean, to compound their misery after hearing that 19-goal striker Adam Rooney will be out for up to six weeks. "I can't be certain from where I was and having seen it again I can't be certain it's a penalty either way," McInnes told BBC Scotland. "We changed our shape to deal with their front two and I thought we dominated that side of it. By doing that at times it takes away a wee bit more of our threat but Niall and Peter still got into good areas, Graeme Shinnie made good runs down the side, and there was a few things bouncing around their box." 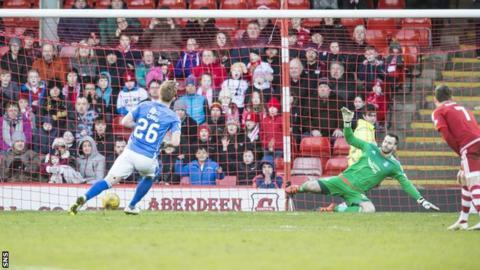 St Johnstone manager Tommy Wright admitted his side were second best for much of the game, but was delighted to take a late point from Pittodrie to move them up to fourth in the Premiership. "Aberdeen were better for most of the second half which you expect from a team with their tails up, but we defended well and showed what no-body can never doubt; the character of this team," he told BBC Scotland. "I thought the two centre halves were magnificent. We huffed and puffed a little bit but whilst it's 1-0 you always believe you can get a chance. "In recent weeks as a group we haven't been a good as what we should have been, but we're delighted with the position where are in the league, it's very much in our hands in terms of the top six. "With three home games coming up we've got to make sure we put ourselves in a good position."